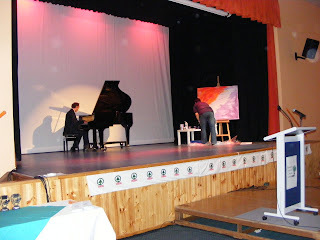 Performance piece...She paints to music... was an idea that Cameron Mitchell and I came up with as an entertaining piece to do on stage at the Boonah SPAR Art Awards. 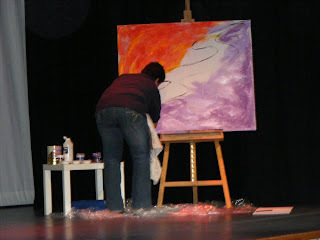 I was the event coordinator so I wanted the people who attended on the night to catch a glimpse of the "artist" at work. 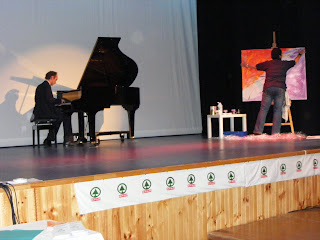 Cameron Mitchell is a local musician who is an awesome pianist so we got together, on the night he played the grand piano with an original composition, and I painted to the music. The end product...the painting then was auctioned off. Not having enough time to practice for the night in the lead up.. i totally winged this one... and ended up just listening to the music and painted most of it with my hands... it worked though...aprox 8 min... painting titled "She paints to music".